A BIG THANK YOU once again to 11-year-old Joshua for providing us with video highlights! 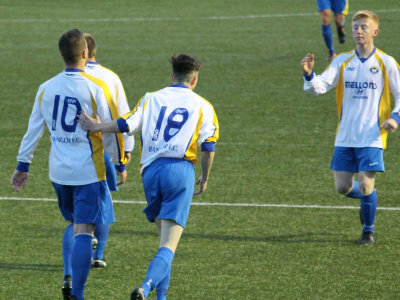 A late goal from Niall Atkinson gave Bangor a pre-season victory over Crumlin Star. The first half began in a competitive nature with both teams trying to assert their authority. 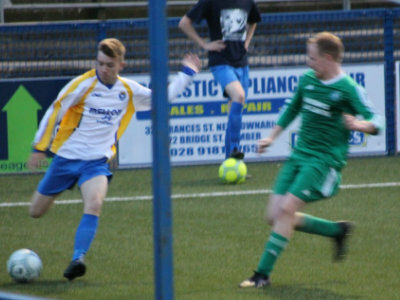 One mistimed Bangor challenge gave Crumlin Star an opportunity from 25 yards after eight minutes. 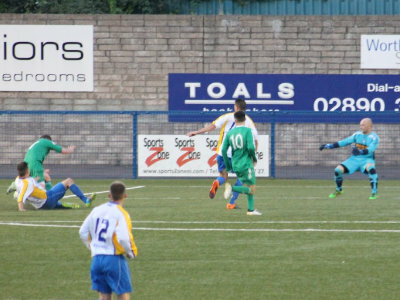 Bangor goalkeeper Darren Gibbons came to his side's rescue to brilliantly keep out Barry McKervey's curling effort. 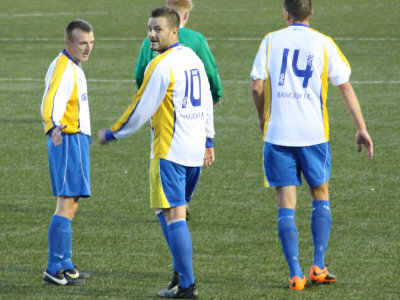 Neil Graham, a new signing from Derriaghy CC, did well to beat his man inside the visiting penalty area but his left footed shot lacked enough power to trouble Thomas Turley. 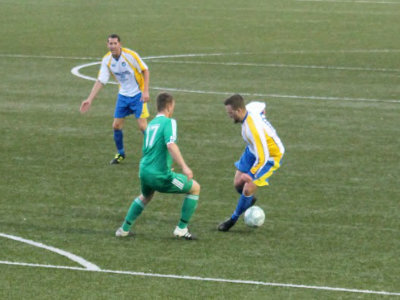 Bangor continued to press forward but Michael Edgar could not get enough direction to his header from a deep Eddie Williamson free kick. 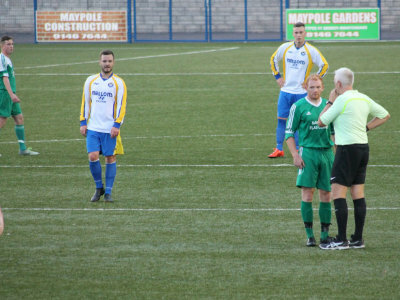 It was a familiar story at the other end of the pitch when Joe McNeill headed over from a McKervey corner in the 25th minute. 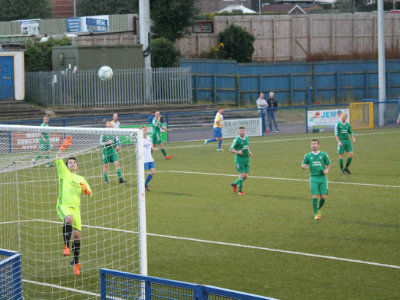 After a feisty start the game settled down with neither side troubling either goalkeeper until the 43rd minute when a driving run and shot from Joseph McNeill was deflected just wide of the Bangor target. The second half began in at a fast pace with the visitors on top. James Doyle created space for himself but his dipping effort from 20 yards was straight at Darren Gibbons. 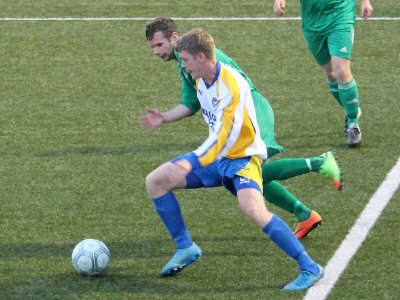 A great run from Doyle upset the Bangor defence but Noel Halfpenny couldn't get the connection he needed as the ball rolled wide of the target in the 53rd minute. Bangor had to weather a Crumlin Star storm as Gibbons held a Joseph McNeill drive before he tipped a Barry McKervey effort around the post. The visitors looked certain to take the lead in the 80th minute but just as Aiden McNeill shaped to shoot from 16 yards, Dean Justin made a last ditch challenge to deny the visiting midfielder. 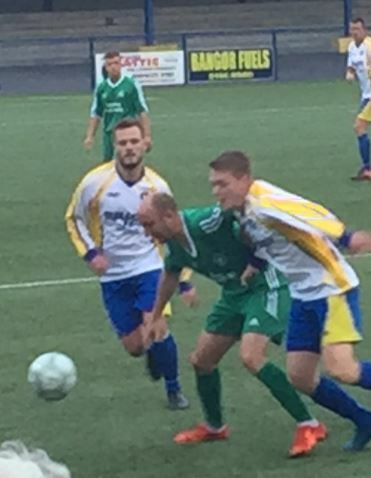 That tackle made the difference for Bangor and when substitute Ross Craig broke clear on the right wing, his low cross found the advancing Niall Atkinson who was able to squeeze the ball into the bottom corner in the 87th minute. With only moments to go, Darren Gibbons once again had to be alert to keep out a drive from Miguel Chines. Gibbons, Justin, S Woods ('83 McGregor), McClean, Edgar, Williamson (46 Craig), Graham ('86 Emerson), Armstrong, K Woods ('63 D Beattie), Atkinson, Bowers ('75 Ogle). Turley, Pridgent, McConnell, Gormley, McLaughlin, J McNeill, A McNeill, Halfpenny, Doyle, Lavery, McKervey. Subs: Murphy, Chines, Mullen, Beattie.